Mogalvin is the brand name of the hot-dipped galvanized steel produced by UNICOIL. The steel strip is coated with zinc using a continuous and controlled process. The tight metallurgical bond between the steel and coating takes place in a continuous galvanizing line supplied by Danieli, Italy. Prepainted galvanized steels with brand names of Molawan, ColoRite Standard, ColoRite Premium, and ColoRite FluoroCarbon are manufactured to meet the technical requirements of various industrial applications of pre-painted galvanized steel, in terms of flexibility, stain resistance, corrosion resistance, surface hardness, and scratch resistance. Special functional products are also available under the categories of Molawan and ColoRite. 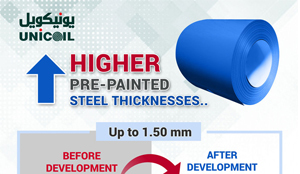 UNICOIL (Universal Metal Coating Company) was established in 1997 as the first company in the Middle East to manufacture pre-painted steel and aluminum coils, and progressively emerged as a leader in the steel coil coating and pre-painting industry in regional markets. UNICOIL was established by two industrial pioneers (namely Zamil Group Holding Company and Rashed Abdul Rahman AlRashed & Sons Group) as a joint venture trading in the Kingdom of Saudi Arabia with a world leader in the pre-painted steel industry (BHP of Australia). Product Transparency – of Printing Product Parameters on Every Linear Meter. 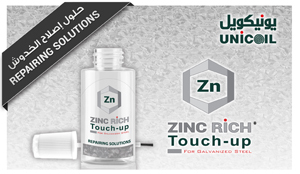 Precise Dimensional Tolerances & Tight Control on Zinc Coating Mass. Continual Improvements Through Research and Development. In-house Paint Mixing Station for Quick Paint Availability. Algorithm Logic Based Production Planning and Scheduling System for Prioritizing the Deliveries. Stocking of Finished Goods for Customers With Long Term Agreement. Well-Equipped Laboratory Specialized in Metal Coating and Organic Coating. Provides Quick Laboratory Test Services for Free. User Friendly Customer Login Facility. Customer Can Login to His Account 24×7 – and Access the Information Even During Weekends and Beyond Working Hours and Get a Dynamic Response. Wide Spectrum of Products Meeting Various Business Needs. Protection of All Business Dealings. 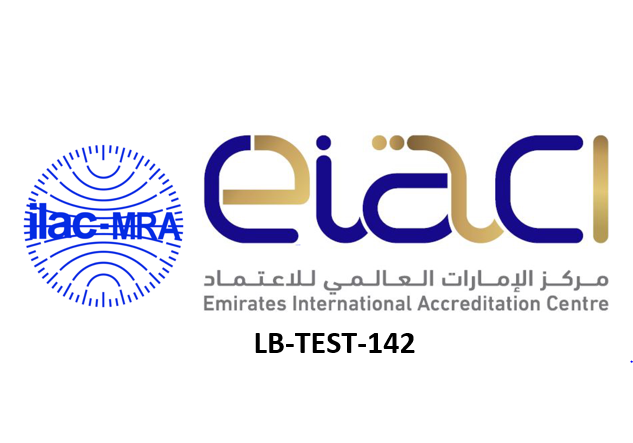 Acquired Eight Quality Marks in Recognition of its Strict Adherence to Quality Management, Health and Safety Management Including Laboratory Accreditation. Quick Organizational Response to After Sales Technical Queries. Online Touch-Up Paint Request Through Customer portal. Pro-Active Advisory Notifications on Shipment with Packing List. Online Invoices and Payment Acknowledgement Notifications.